How to invest money? What is a golden rule of Investment? Well, saving and investments are the foundation for the financial success. However, many of us neglect to put this into practice and, therefore, faces difficulties in achieving financial goals. Most individual accept that they invest in financial products without understanding. In short they don’t take informed decisions. This will cause a delay in fulfilling financial dreams of the individual. Considering this fact, I am here with 10 Golden Rule of Investment. These rules will surely help you to achieve financial success. We earn regularly, we spend regularly, but we don’t invest regularly. So, my first golden rule of investment is “Invest Regularly”. The regular and systematic investment will help you to achieve your financial goals like buying house, car etc. Most of these goals require substantial money upfront in order to be fulfilled. The regular investment will help you to fulfil these goals. The day you start earning money you should start making investments. The earlier you start more return you will get on the investment. The compounding effect helps you to earn interest over interest. You can build substantial wealth by starting at the early stage of life. The third golden rule of investment is to understand the product well before making an investment. It reminds me about one old proverb: “All that glitters is not gold.” There are many products available in the market which is complicated in nature. If you are planning to invest in these products you should understand it properly. I have seen marketing of some products are done in the manner which will lure investor with unrealistic returns. You must stay away from these products. This product may contain some hidden risks which are unknown. You should diversify your investment. Never keep all your eggs in one basket. Invest in multiple investment products as per your financial goal and risk appetite. Diversification does not give you guarantee in profit, however, it will help you to reduce the overall risk associated with your portfolio. You should monitor and rebalance your portfolio at regular interval. The ideal frequency of monitoring your portfolio is six month. At the younger age, you should explore and invest in equity because at the initial stage your risk taking capacity is high. As you grow old you should reduce your investment from equity and invest in fixed income/debt-based instruments. It is better to expect reasonable returns from investments. Once you achieve your investment target you should book the profit and exit from the investment. Never expect unreasonable returns from the investment. For example, if you think that your investment has potential of earning a return of 15%, you should exit once you reach this target. You should never become greedy. Remember “No gain satisfies a greedy mind”. You should do a proper analysis before making an investment. You should hold back yourself from buying or selling in a hurry as it may lead to financial losses. Proper study and homework are necessary to make a profit from investments. Inflation and Taxes are two important factors you should consider before making the investment. You should judge investment product from the actual rate of return. The actual rate of return is return is given by investment- Inflation rate – Taxes. We cannot control growing inflation rate, but we can select tax friendly investment option to earn more returns. You should spend sufficient time with your investment, before and after making an investment. Proper homework will help you to select a right investment. Performance monitoring after investment will help you to stay on track. If you can’t spend time with your investment you should get in touch with a financial planner. Last golden rule of investment never relies on tips for making an investment. Instead of investing on the basis on tips, you should consider fundamentals of the investment instrument. I would like to end this article by sharing a most effective rule of money management by Warren Buffet. Rule -1 Never Lose Money. 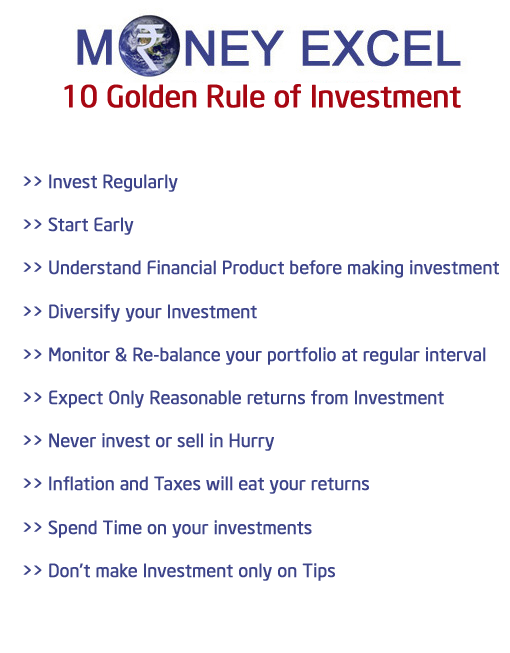 Hope this golden rule of investment will help you to achieve financial success. If you like this rule of investment, do share it with your friends on facebook and twitter. These are some excellent points. A very good post indeed. In fact just to add to Rule 8 and Warren Buffet’s Rules 1& 2, we should be very clear of the term “Capital Protection”. Many products promise capital protection as worst case scenario – that is if someone gives Rs 1000 and gets back Rs 1000 after 3 years, he thinks his principal is intact and no gain no loss. He is wrong. Because of inflatiom, the buying capacity of Rs 1000 is probably only Rs 960 or so. Plus another notional loss is opportunity cost – his Rs 1000 in another investment could have become Rs 1300. Real capital protection can only happen when one gets back at least Principal + Inflation. You have made some great points in the post! If I’m just starting my career and have some money to invest (either lumpsum or monthly), where should I be starting ?